HI!! 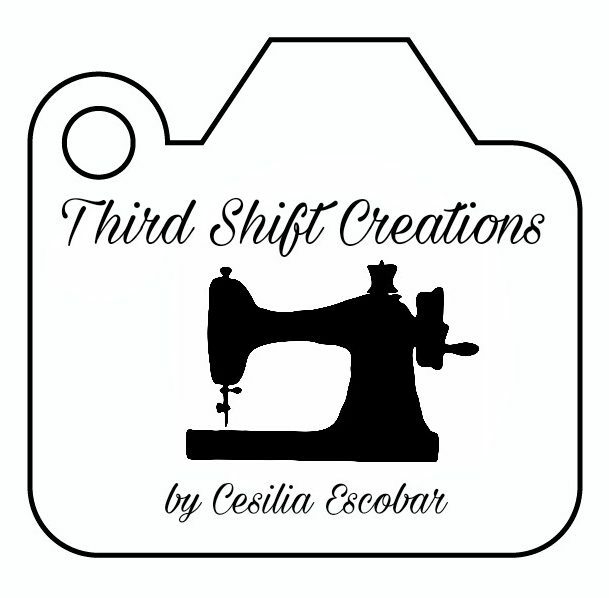 Im Cesilia Escobar from Third Shift Creations, and this is my first tour!! Super thrilled! Our summers are hot and fall never comes fast enough but when it cools down its a shocker since we are used to the triple digits. The best part of this fall is that I will be ready with my Origami Cardigan from Love Notions and my version of a hacked Twisted Tunic. And did you know Tours LOVE to have a sale!! Get yours now!!! So this week only, grab your copy of the women’s Origami for $8 or the girl’s version for just $6. Sale ends Saturday September 30 at 11:59pm cst. She also has tier pricing for her patterns. If you buy 2 or more patterns, you get 10% off! 3 or more, you get 15% off! 4 or more, you get 20% off! This is my pink and cozy Origami Cardigan in sweater knit from the dollar knits at Walmart. You can’t tell it was $1. The one thing I do with any light sweater knit I sew is that I use some type of stabilizer on the shoulders in order to avoid the shoulder seam to drag down. I used less than 3/8 thin strip of cotton woven -glued it in place first with a glue stick- and serged it. Im aweful at hemming so for this one I did cuffs. not the best material to do cuff from but I like that it’s a loose cuff. I can not wait to be able to wear it!! Pintrest is addicting… needless to say thats where I got the twisted sweater idea and a faux turban headband I had sewn gave me the confidence to tackle it down. My vision for the twisted sweater was to be a slouchy fun multi use top. The down side is that it will be a bit bulky where the twist is at. It took some time to get it right but staying up past midnight to figure it out was worth it once I was able to make it lay right. Fear not! I wrote it down and took some pictures so you can make this cute Origami- Twisted- Sweater. I tried it with DBP but didn’t look as I had imagined it. The material was too light and the twist weighted the whole thing down. I also tried to slim it down a bit but then the twist would be higher. So I used an interlock from Joanns. I cut the cardigan front, and the back with the neckline of the front. I took 3 inches from the grey shaded part of the cardigan pattern for a slightly loose look. You can take more or less depending if you want it fitted or loose. I also made the neck 3 inches lower. You will have to calculate a new neckband than that provided in the original instructions. (measurement of neckline)(0.85)=Length of new neckband with same 3″ in width. Im 5’4″ so I shortened 6.5″ from both front and back of the pattern to make it a bit shorter. I used a band instead of doing a hem. To get the measurments I used the same method as the neckband. (bottom raw hem mesurement)(0.85)= new length by 6″ in width. You are going to attatch the shoulder pieces, sleeves and sides as directed in the instructions. Next will follow with attatching the bottom band. Use as many pins or clips to sew it evenly and while stretching the band. For the neckband, again use as many clips or pins as needed to sew the neckband evenly. After the neckband is attatched and the hem is done we will work on the twist. With RST of the cardigan front we will divide and mark into three equal parts. We will mark both wrong sides and right sides of the front and back pieces to make it an easier process. Lay the top (orange) piece at the first 1/3 mark of the bottom (green) piece. Fold the top neckline (green) piece over the top (orange) neckline. Now turn the entire piece to the left, like turning a page on a book. Fold up once again and pin/clip in place on the left side. Because of the many layers I recommend using 1/2in- 3/4in seam allowance for this part just to be sure that everything gets sewn. Unfold your new Twisted Slouchy Sweater and pair them with your favorite leggings or jeans for a fun looking Twisted sweater! You can wear it with the twist to the back or to the front, either way it looks super cute! Prizes include $50 to Love Notions, $25 to Simply by Ti fabrics and a mystery box from Sly Fox. International winners will be responsible for their own shipping. Love both of the versions of the Origami that you made!! Thanks for joining us! Love the tip about stabilizer in the shoulder seams! Thank you! I’m a big fan of walmart/hobby lobby cheap knits as well, but they struggle at the hemline and shoulders, as you said. Love your versions of the top. Beautiful! CUTE! How fun is the purple sweater? I absolutely love your makes! Your pinterest project is awesome! I love it with the knot in the back!